Canadian customers pay in US$ plus GST (and TVQ/PST in Quebec). All payments, including credit card payments are made through Shopify or PayPal. (If you’re not familiar with PayPal, it only takes a few minutes to register online when you receive our PayPal invoice at your email address. PayPal gives you two layers of protection: 1. We never know your credit information. 2. PayPal red flags you if dealing with a disreputable vendor). If using a credit card, proceed to Shopify shopping cart. The PayPal payment option will still be available on Shopify. 3 Your package(s) will ship within two business days and you will be emailed your tracking info. 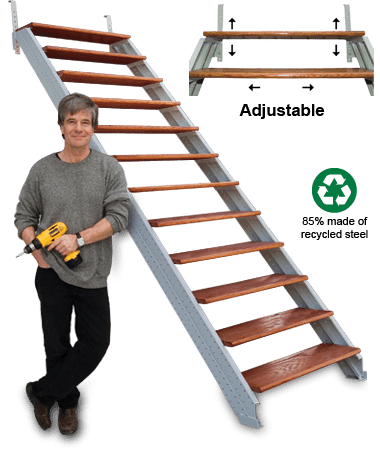 4 Receive, assemble your stair stringers and install your stairs! See 2 to 5 day ground Shipping charge finder by destination ZIP/Postal Code. We ship all over the continental US & Canada. We do not ship COD. All shipping charges include carrier insurance against loss or (near impossible) damage. Ready to order? See our catalogue!